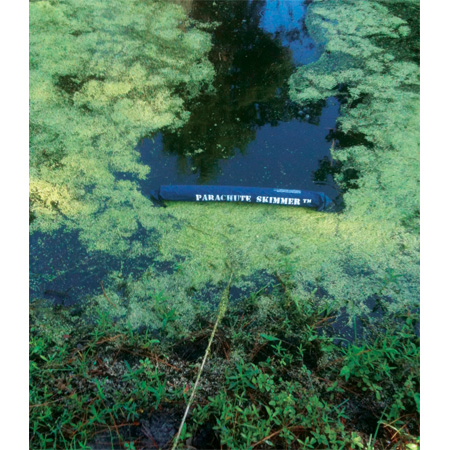 Remove floating debris quickly with the pond and lake Skimmer. Simply drag across the surface of the water to collect floating debris like algae, duckweed, leaves or dead vegetation. The patented skimmer measures 5 feet in width to cover optimal surface area and is constructed with an ultra tough, pvc coated, collection screen. This easy to use Skimmer sweeps a five foot wide area using a heavy duty mesh screen to capture everything in its path. Great for filamentous algae. It is also ideal for duckweed, watermeal, and smaller vegetation. As the skimmer is pulled from the water, the net closes, catching the debris. Includes a float and 24' pull line for easy skimming. This product is very simple yet effective. i rarely do reviews, but I have to say that occasionally a product comes along that is so simple, effective and affordable that it is worth mentioning. I had talked to several pond experts who wanted to charge many thousands of dollars to correct my weed and algae problem when in reallity all i needed was the weedshear. Low cost, high quality environmentally friendly solution. What more can you ask for?